Once you have logged in to your account, you will be presented with a home screen. Click on the Create a new CV. A dialog box will show asking for a name. Give your CV a name, for example, “My academic resume”, and you will be presented with the CV creation wizard where you will provide all your details. The same home screen lists all you the CVs you have created. 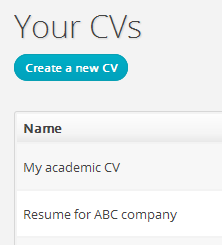 You can edit a CV by clicking on its name. You can add custom sections to your, for example, “Personal projects” or “Awards and achievements” CV by clicking the Add a new section button. You can rename any of the sections in your CV by clicking the tiny pencil icon to the right of the section name. Work experience and Education are special sections to which you can add multiple entries, that is, details of your past jobs and schooling. To add a new entry, click the 'Add entry' button. You can delete an entry by clicking the Delete button underneath it. 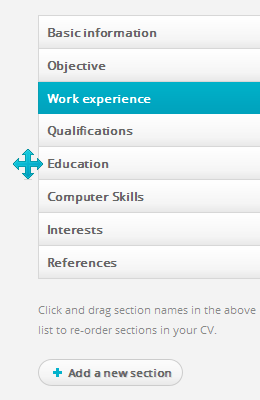 You can re-order the entries you add in Work experience and Education by simply clicking on them and dragging. However, when you have many entries, it becomes difficult to drag them vertically across the page. You can collapse the entries for easy re-ordering by clicking in the collapse icon to the right of the section title along with the rename icon. Once the entries are collapsed, you can reorder them easily by clicking and dragging. Clicking on the collapse icon again will expand the entries to their normal state. It's impossible to automatically deduce where a pagebreak is aesthetic, and for that reason, sometimes, you get pagebreaks in undesired places. In such cases, or for whatever reason, to force a page break in the output PDF, use the page-break button in the editor toolbar. This inserts the [page-break] tag, that becomes a hard page-break in the PDF you download. Preview lets you preview your CV in a template of your choice in the browser without having to download it. Quite useful to check progression as your work on your CV. Download lets you download a copy of your CV (PDF or HTML) to your computer in a style of your choice. 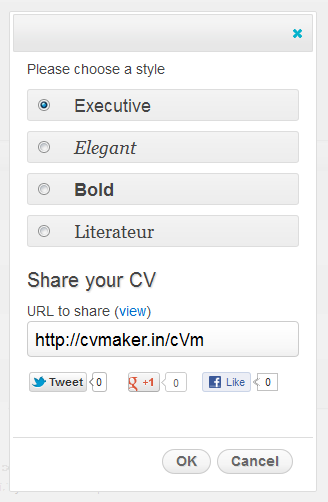 CV Maker can host online copies of your CVs so that you can publish and share them. Clicking on the Share button beside your CV in the home screen will bring up the sharing options. The sharing options dialog shows the public URL of your CV which you can copy and share with anyone. 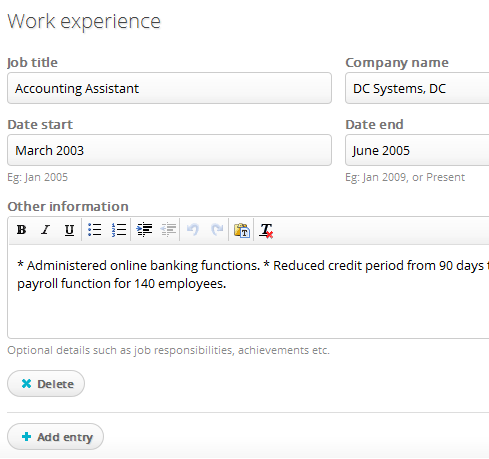 You can also share your CV on Facebook, Twitter, and other social network sites by clicking on the appropriate buttons. The sharing options dialog also presents you to the different style choices available. Choose the style you wish to publish your CV in, and press OK to save your preference.